aAa® numbers for a cow or heifer are written from left to right in the order she needs them, starting with the aAa® number she needs the most. aAa® customers usually have three aAa® numbers assigned to each cow or heifer. aAa® numbers for a bull are written from left to right in the order he possesses them, starting with the aAa® number he possesses to the greatest degree. AI bulls may have two, three, four or six aAa® numbers, depending on the age of the bull and the bull owner’s preference, but aAa® numbers for bulls are always written from left to right in the order the bull possesses them. 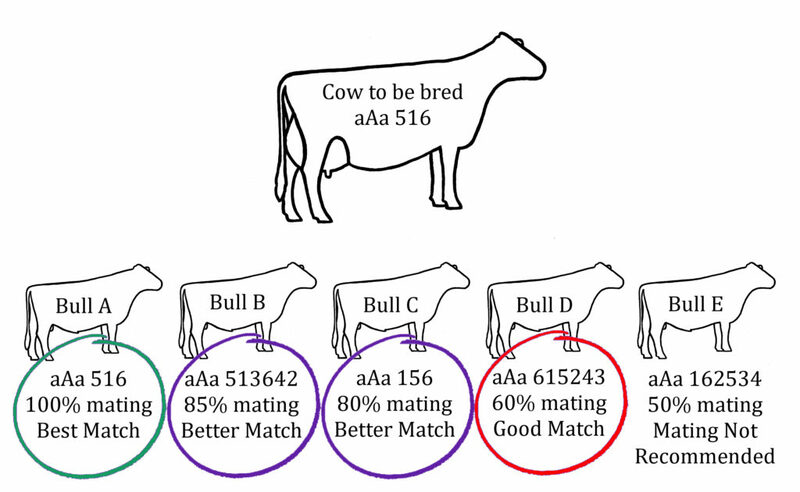 Bull B’s aAa® numbers and the cow’s first 2 aAa® numbers match exactly, so he brings to the mating the 2 aAa® qualities she needs the most in the order she needs them. The cow’s third aAa® number is a quality Bull B still may possess to some degree because it is his fourth aAa® number. The calculated accuracy of this mating is 85% and Perfect Match® lists this bull in the “Better Match” column for this cow. Bull C brings all the aAa® qualities the cow needs, although the quality she needs most is not the quality Bull B possesses to the greatest degree. The calculated accuracy of this mating is 80% and Perfect Match® lists this bull in the “Better Match” column for this cow. Bull D possesses all the aAa® qualities the cow needs, but he may not be as good a source of her most needed aAa® quality as the bulls above. The calculated accuracy of this mating is 60%, which is the mimimum accuracy recommended for aAa® use. Perfect Match lists this bull in the “Good Match” column for this cow. Bull E does not possess the cow’s most needed aAa® quality in his first 3 aAa® numbers. Because he does not bring to the mating the aAa® quality the cow needs most, this mating is not recommended. The calculated accuracy of this mating is 50% and Perfect Match® does not list matings of less than 60% accuracy for any cow or heifer. aAa® Perfect Match® allows users to upload their cows’ information, then upload selected bulls or choose bulls from the aAa® Bull Central® database. Perfect Match then displays matings for each cow listed in order of the accuracy of the matings. Users may download or print their results for easy reference at breeding time. The “aAa® Use Made Simple” spreadsheet allows users to make matings of at least 60% accuracy for an entire herd of any size using as few as 8 bulls. The aAa® Bull Central® database lists the aAa® numbers for over 70,000 AI bulls of all breeds analyzed worldwide since 1950. The above services are provided free of charge to aAa® users. Your analyzer can help guide you in finding and using the tools that best fit your breeding program.